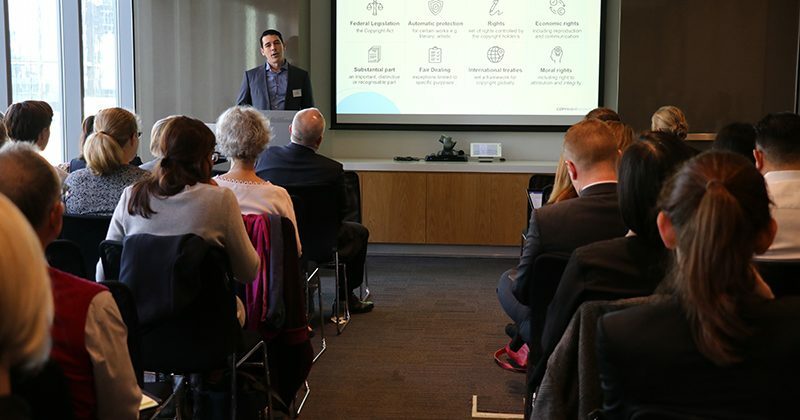 The Copyright Agency recently held a CPD session for lawyers on copyright, in partnership with the Association of Corporate Counsel (ACC) Australia and Holman Webb Lawyers. In-house lawyers had the opportunity to hear pointers on how to assess copyright risk and implement a framework for creative outputs and software within their organisations. Holman Webb Partner, Tal Williams introduced the session by outlining that copyright education amongst employees is key. “Copyright is a big issue and many disputes involve ex-employees or derive from the fact that contractual obligations around copyright were not thought about upfront,” he says. Copyright Agency Senior Licensing Consultant, Greg Taylor, talked through key copyright concepts and addressed common myths. “Working in businesses, staff are going to come into contact with copyright material; generally, the level of understanding around that is low or there can be misconceptions around it, which creates a risk of them unwillingly infringing copyright,” he says. Copyright ownership was also raised as an area of confusion. “If the content creator is on staff and the work is created as part of their job usually their employer owns the copyright. If the content creator is a freelancer then they usually retain copyright unless the contract specifies otherwise. For example, photos taken for a particular campaign might not be able to be used for another purpose without asking permission first,” explains Greg.